Photo: Monroe Schools Superintendent Arnie Elam with Crystal Apple Award Winners Becky Eschmeyer and Tammy Larison. 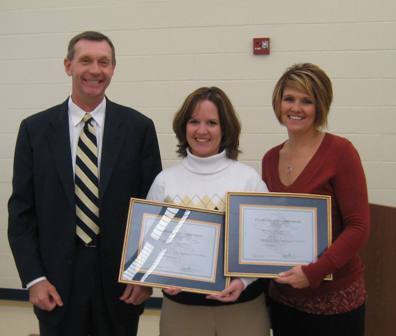 The school board acknowledged and awarded certificates to both Crystal Apple Award Recipients, Becky Eschmeyer and Tammy Larison at the November 19th school board meeting. Monroe schools are blessed with teachers who educate our school children in positive ways. Earlier this year Monroe Elementary School teachers, Tammy Larison and Becky Eschmeyer, were awarded the Middletown Community Foundation's prestigious Crystal Apple Award. Education is a vital part of the foundation of the American society. Over time, the demands on educators have changed dramatically. An ever-increasing number of children come to school from a family environment where basic needs are not met. The education community has taken on more duties as “surrogate parents” and “social workers”. 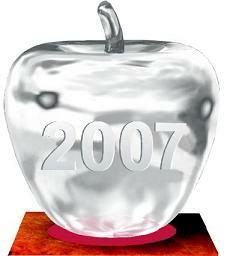 As one way to reestablish community appreciation and respect, local educators and business representatives sought to increase the understanding and awareness of education and its changing demands as well as showcase the dedication of district school employees through this recognition event: The Crystal Apple Awards®!